jamie goode's wine blog: My blog has moved home! My blog has moved home! A short while ago, Blogger, the medium by which this blog is currently published, announced that they'd no longer be supporting publishing by ftp. For the non-technical, let me explain. Currently, I use blogger to compose and organize blog posts, and then I publish them to my own web space, on my domain name, www.wineanorak.com. 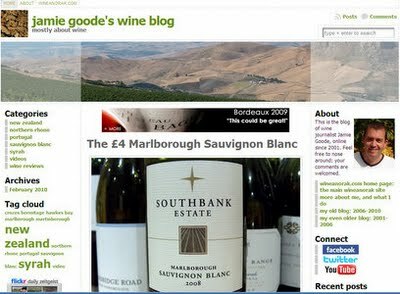 Having the blog integrated into wineanorak.com is important for several reasons, and so this announcement by blogger means I'll have to begin using a new service. So I've chosen wordpress (www.wordpress.org), which is actually a whole lot more powerful, and will benefit the blog greatly. But it does mean that the address for this blog will shift to www.wineanorak.com/wineblog. I'll keep all the existing content here; but I just won't be adding any new material. This will be the third set of clothes for this blog, which started back in 2001, making it one of the internet's oldest wine blogs, and certainly the first UK wine blog. If you are kind enough to have a link to my site on your blogroll, please change it accordingly. It would be interesting to know what you think are the advantages (and drawbacks) of Wordpress, as a self-hosted platform, now that you've moved.